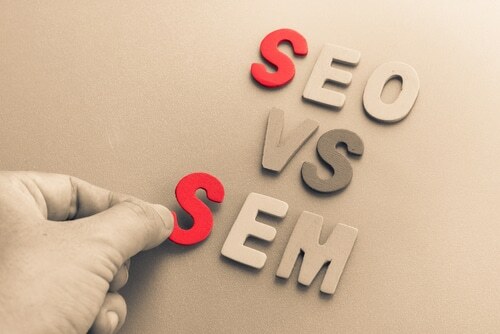 In the world of digital marketing, it can be easy to think that SEO and SEM exist separately of one another. On the one hand, you’ve got search engine optimisation (SEO) – where you’re aiming to boost your website’s visibility in a very organic manner – on the other, you’ve got search engine marketing (SEM) – where you’re essentially paying Google to advertise your services. While there are certainly major differences between the two strategies, finding a way to make them complement one another and work in harmony means you can turbo-charge your ROI. Let us show you how you can turn your individual SEO and SEM campaigns into one big digital marketing beast. 1. You can buy your traffic while also waiting to earn it, thereby speeding up results. When you decide to opt for an SEM campaign – whether that’s PPC advertising, Google AdWords, Facebook ads, etc. – on top of an SEO campaign, there’s a good chance you won’t have to wait as long to see results. SEM focuses on gaining traffic quickly by paying Google to feature your advertisement at the top of search results pages, while SEO requires a nurturing approach over a longer period of time. As such, you can enjoy near-immediate results from your ads while waiting for your optimised website to take effect and climb up Google’s ranks. 2. If both campaigns are orchestrated well, you can appear on page one twice. Following on from the previous point, once you have both campaigns effectively up and running, you have the chance to double your presence on Google’s first page. Herein, you’re beginning to dominate the online sphere while building up familiarity with your audience – users see your brand pop up as an ad at the top of the page, then again in its organic website form later down. 3. By using important keywords for your website and more specific clusters for your SEM campaign, you can tap into different audiences and broaden your reach. Because SEO and SEM operate differently, it’s a good idea to choose different keyword phrases rather than just applying the same ones to each campaign. General keywords that encapsulate the bulk of your business should be reserved for your SEO strategy in order to get you recognised for the products and services you offer. Meanwhile, your additional, longer-tail keywords can be allocated to your SEM ads to really hone in on your target audience and encourage click-throughs and conversions. Furthermore, when you have two campaigns active at once, you’re granted two different streams of results to dissect and analyse, thereby helping you really gauge which keywords your users are most searching for. Integrating your SEO and SEM campaigns can garner major benefits to your overall digital marketing strategy: you can fast-track your results, double your dominance on page one of Google, and organise keywords to target different audiences. At the end of the day, approaching SEO and SEM as complementary strategies to one another helps to generate traffic from all corners of the digital landscape – whether organically or through paid advertising. keyboard_arrow_left What do the Highest-Performing LinkedIn Posts Have in Common?